What’s for dinner??? I had no idea what to make for dinner this evening. So I had to scan the pantry and refrigerator to see what I could pull together. This is what I had in my refrigerator- cooked chicken breasts, Monterey Pepper Jack cheese, sour cream, and 1/2 can of Rotel tomatoes, (the other half I added to my guacamole dip on Sunday), cilantro, and red chili peppers, which were graciously donated from my friend. In my pantry I had cream of chicken, cream of mushroom, cream of tomato soups, and black, red and white beans, barely any noodles, and a few opened bags of tortilla chips. 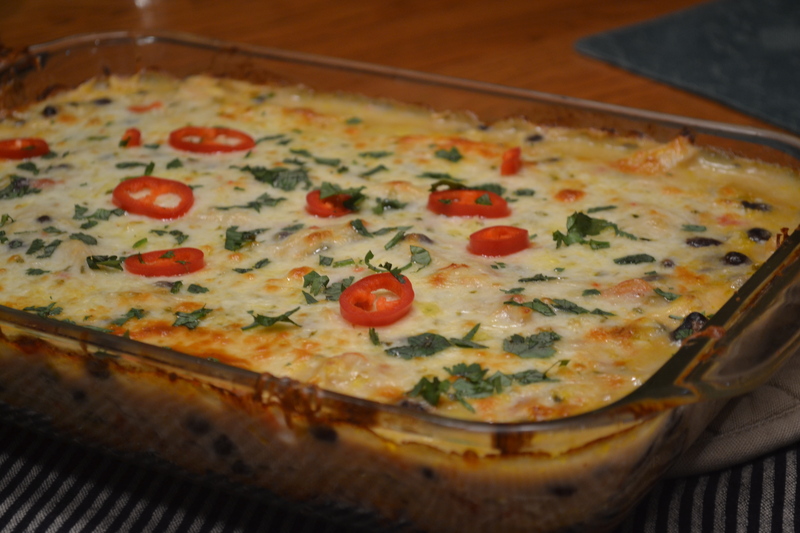 Hmmm… I’m thinking something with a Mexican flare… soooo I grabbed the chicken, cheese, sour cream, cream of chicken soup, beans, and tomatoes, cilantro and chili peppers and turned it into this yummy casserole! I love it when things aren’t planned yet they still come together. I don’t mean that I always like it when things are unplanned, but when they aren’t planned and they come together – that’s a good thing! It is soo much easier to come home from a day at work and prepare a planned meal. But that was not the case tonight. These ingredients were not purchased to make this particular dish, but with an open mind the recipe idea presented itself. As I was gathering the ingredients, it made me think about how many things in life aren’t always planned, but they work out unknowingly, by the grace of God. We like our lives to be planned, predictable, and orderly – we get a sense of security and trust from this. When unplanned events happen to us, it can shake our faith. That is when we need to remember this verse and let God work in our lives. Last night, my bible study group discussed the verse above because the topic was about trusting God. It can be very difficult to trust God when we can’t see where he is leading us. Many unplanned and unexpected things happen in this life. But if we can be patient and trust in the Lord, the pieces will eventually come together. There isn’t always a set “recipe” in life, in fact most of our lives are much like that of a thrown together casserole! A concoction of many different people and unplanned circumstances, which in time becomes a unique and beloved story! I would love to hear about some of the unplanned dinners you created, or unplanned events that came together for you! Please share! If you make this recipe, let me know how it turned out! Preheat oven to 350 degrees. Grease a 9×13 casserole dish. 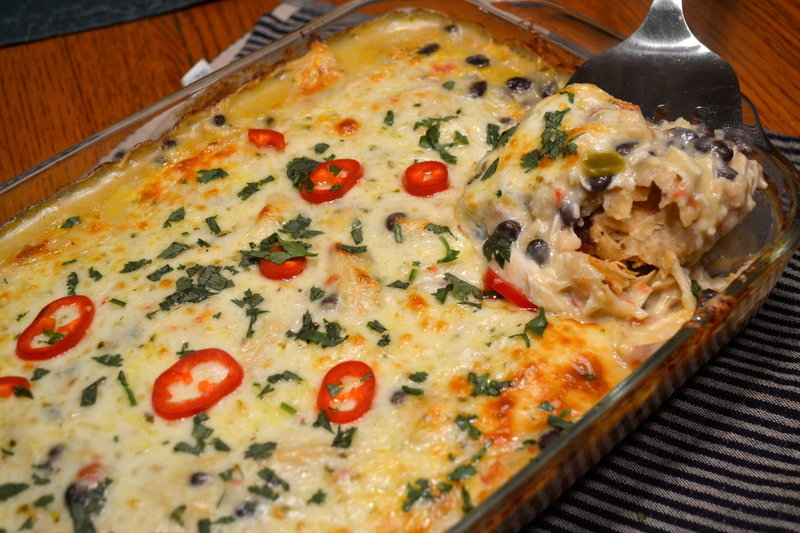 Break up the tortilla chips into small pieces in the casserole dish as the bottom layer. In a mixing bowl, mix together the chicken, cream of chicken soup, black beans, tomatoes, milk, and sour cream. Spread on top of the chips. Sprinkle the cheese on top. Bake for 30-40 minutes uncovered until bubbly and slightly browned. Remove from oven. Sprinkle the cilantro and peppers on top.